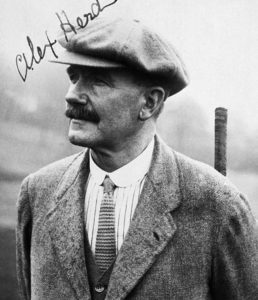 The great Sandy Herd was runner-up at The Open Championship four times over 28 years but claimed the Claret Jug only in 1902 at Hoylake by a stroke from Vardon and Braid. His victory popularized the new Haskell ball with a wound rubber core. It was said to give 20 extra yards compared to the old gutty, but supplies were scarce in Britain at the time and Herd, like most, was skeptical until trying one out in a practice round with his friend John Ball, the Hoylake amateur, who had already adopted the ball. Herd won the British Professional Matchplay at age 58 and still played tournaments to a high level at nearly 70. He was a very quick player, but still had time for several ferocious waggles of the club while standing over the ball. He claimed to have made 19 holes in one, including 13 at Coombe Hill, where he was the longtime professional. His 1902 winner’s medal sold at Bonhams for $79,416. The following was published upon his death in 1944 – it is worth a read! 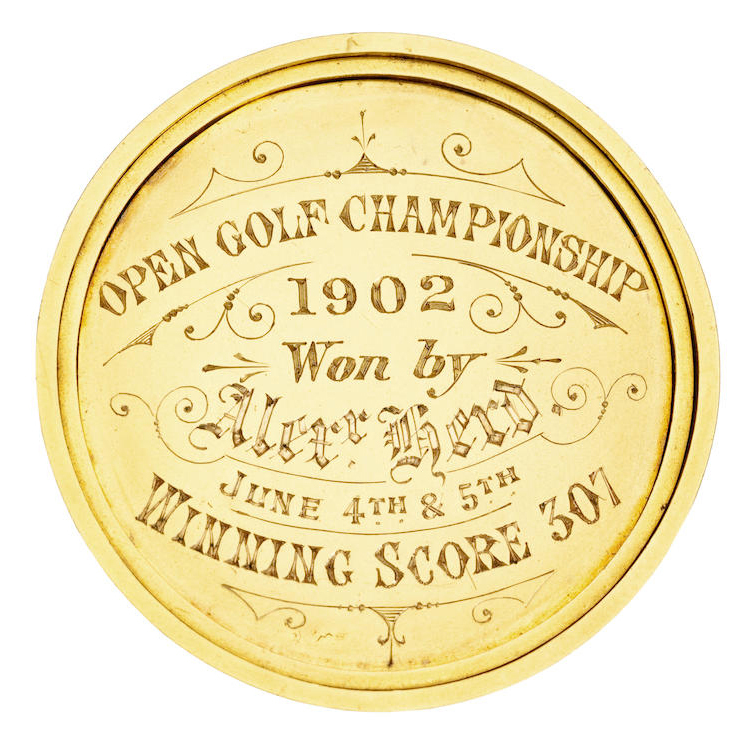 Alexander (Sandy) Herd, winner of the Open Golf Championship in 1902, died yesterday (2/18/44) in a London nursing home from pneumonia following an operation. He was 75 and is survived by his wife, four daughters, and two sons what are professional golfers. Sandy Herd – writes a former Golf Correspondent of “The Glasgow Herald” – to the present generation of golfers, must be little more than a name. 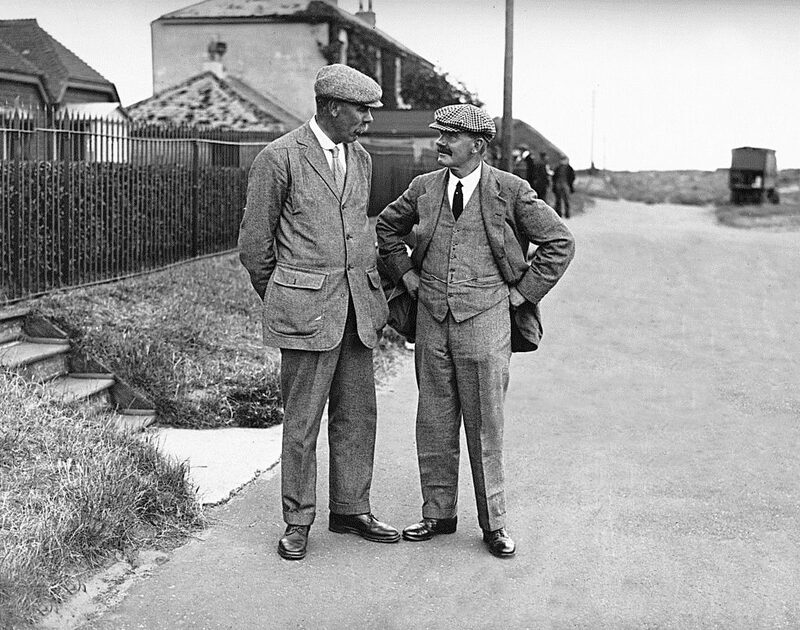 For he was a contemporary of the great triumvirate – Vardon, Braid, and Taylor – and was more closely associated with them than any other professional. He took part with them in the famous international foursomes, over four greens in 1905, and with them, by his fine gentlemanly bearing, he helped to life the whole status of the professional golfer into something it had never been before. He was, too, one of only four men who broke their practical monopoly of the Open Championship over a period of 20 years. And though the oldest of the four, he lasted longest as a player. Herd was born at St. Andrews on April 24, 1868, and he never lost either his fine broad Fife accent or his love of his native town. His grandfather was a caddie, and his father a working mason earning 25 shillings a week. He started playing golf in the streets of St. Andrews with shinty sticks, and for balls he used champagne corks rescued from refuse heaps behind the R. and A. Clubhouse, inserting screwnails into the corks to give them weight. He started life as a baker, but got the sack twice a week for spending his time on the Old Course when he should have been in the bakehouse. Then he became a plasterer, and worked for four years as a journeyman. He picked up odd jobs caddying. His golf clubs were bought by hard savings, one at a time. 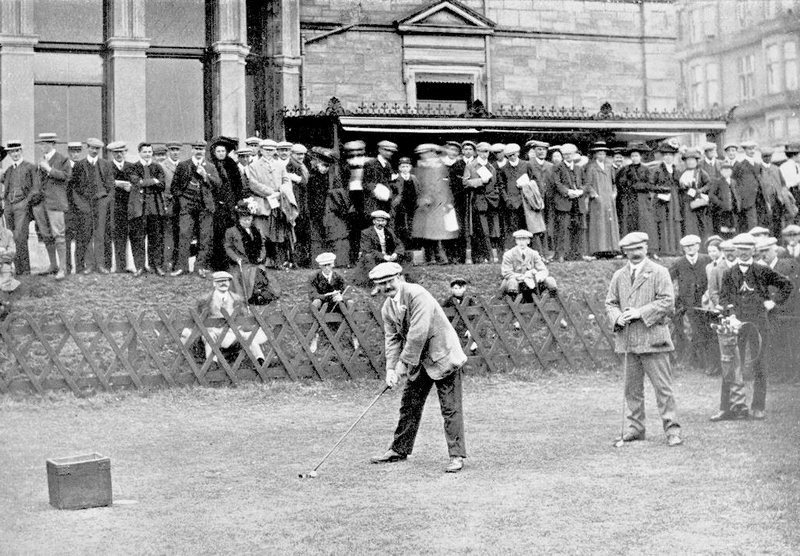 He was better off for balls, for an uncle worked on the railway, and many balls find their way to the railway on the Old Course at St. Andrews. A three months’ job at Royal Portrush in the summer of 1890 saw him return to St. Andrews with 40 gold sovereigns in his pocket, and that determined his career. Another temporary engagement at Blundellsands was followed by a post at Loughborough, Leicestershire. Then came Huddersfield, where he was a professional from 1892 till 1911: and from Huddersfield he went to Coombe Hill, and finally to Moor Park, where he spent the rest of his professional life. 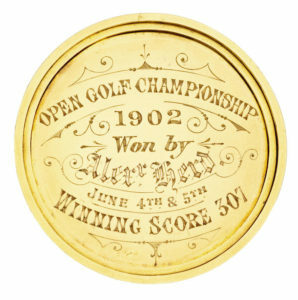 Herd’s first attempt at the Open Championship was in 1885, when he was 17 years of age. 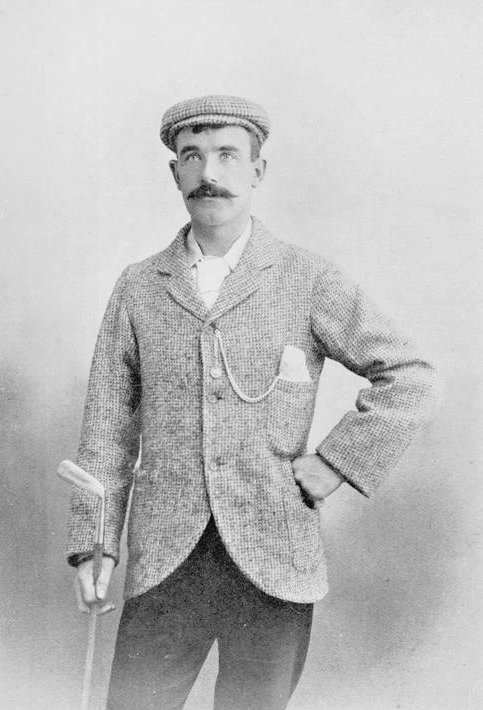 He played in white fustian plasterers’ trousers, his working jacket, and a double-pleated cap, and his golf equipment was the modest one of a driver, a spoon, a cleek, and an iron – no putter and no bag; and a younger brother carried his clubs, for a plasterer earning 10 shillings a week could not afford a caddie. Seven years later, when he won for the first time the Championship went to Murfield. Herd had become a real challenger. He finished that year second to Harold Hilton. He was second again in 1895. This was a big disappointment. Herd that year had been winning everything in professional golf, but at St. Andrews he played his final round in a hailstorm. Taylor went out when the storm had subsided and beat Herd by two strokes. In 1902, when he was 34, Herd broke through. In his book, “My Golfing Life,” he tells how he arrived at Hoylake brimful of confidence. He knew he had the golf to win. Two days before the Championship, John Ball took him in hand, and in one of their practice rounds, Herd was impressed with the length Ball was getting. It was the Haskell rubber-cored ball he was playing, and a novelty then. Herd had a shot or two with the new ball, and was fortunate in getting a supply which helped him to win the great event. Herd’s biggest challenge after he won was in 1910, the year when the first day’s play was cancelled after a thurderstorm. And in 1920, when he was 52, he finished only two strokes out. That was the year Duncan won after Mitchell’s sad collapse. You can read an article penned by Herd here from 1921.